FAQ: Do you have an extra heavy duty 12v motor for large blinds and shades? Our standard motors are designed to fit Rollease 1.5" tubing, but larger blinds and shades sometimes require a larger size, such as 2.5". Our Maxi series uses 2.5" tubing (63mm OD) and can lift very large shades and blinds. In this article, we'll show you the various components; these heavy duty motors are really not significantly different from our standard series (including the same radio protocol), except that everything is larger, and the lift capacity is much higher. This is a very quiet motor, and despite the tremendous lift capacity, it only uses 1.5 A of current @ 12v DC (very efficient too). Special Note re Extra Large Shades: We often get questions regarding very wide shades for special applications, such as very large projection screens. It can be difficult finding a tube long enough, and the shipping costs can be astronomical. If you have a metal supplier nearby, this may be the best solution. Yesterday we paid a visit to our local supplier (Metal Supermarket) and it turns out they stock 20 ft lengths of 2 1/2" steel tubing, a near perfect size for our Maxi motors! If you are doing a retrofit, you would remove the clutch mechanism from one end, where you are going to insert the motor. Note that the motors can be permanently programmed (with the remote) to operate normally in either direction, so you can choose whichever end you prefer (see blind and shade motor programming instructions). Further to the retrofit situation, you may also be able to use the existing idler mounting at the other end of the tube, or you may prefer to use the one supplied with the motor, as discussed below. 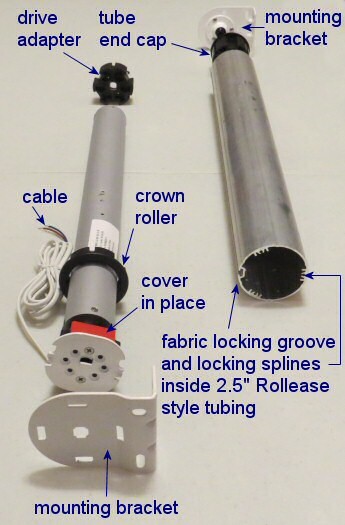 The roller shade motor uses a drive adapter on the end of the drive shaft to rotate the tube, and the rubber crown roller also rotates with the tube. 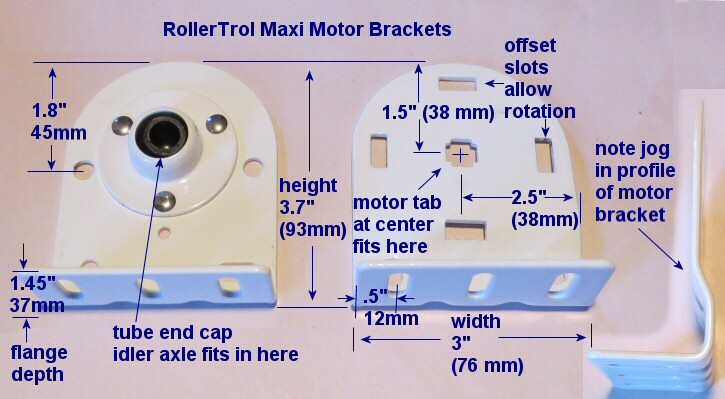 The cylindrical motor housing of the tubular motor remains stationary and is locked to the mounting bracket with tabs. In the picture above, the crown adapter has been partially slid onto the motor, but not right to the end (left side) where it fits into one end of the tube. You must slide this part on, before you attach the drive adapter to the drive shaft with the provided washer and C clip (there is a retention channel machined into the drive shaft that accepts the clip using finger pressure). At the other end of the tube, a tube end cap idler is inserted into the tube, and it has an axle that fits into the mounting bracket; the idler rotates freely with the tube. The minimum tube length is 22" (56 cm), slightly longer for the battery series. 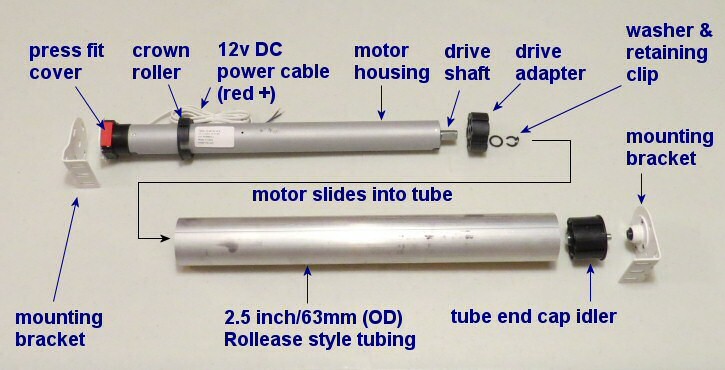 The actual length of the wired power radio motor version (non battery type) is 20.5" (52 cm) from the outside surface of the motor end to the outside surface of the tube adapter, mounted on the drive shaft. The brackets require 1" of clearance at either end of the tube for mounting purposes. If you have an inside window frame width of 120", the longest tube width (and the largest shade width) you can fit into that frame is 118". The pair of pictures below show a closer view of each end. 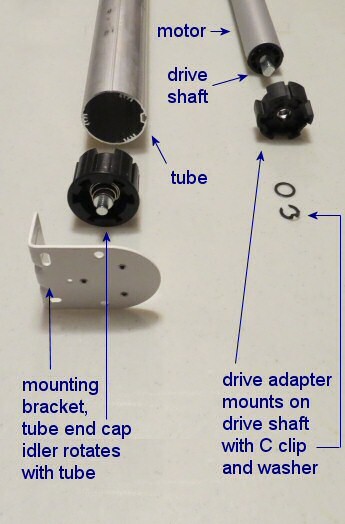 In the left picture, you can clearly see the extruded locking splines that bind the drive adapter (and drive shaft) to the tube so that it can rotate the tube. You can also see the fabric locking slot, but we also use an adhesive strip for fastening the fabric (not shown). 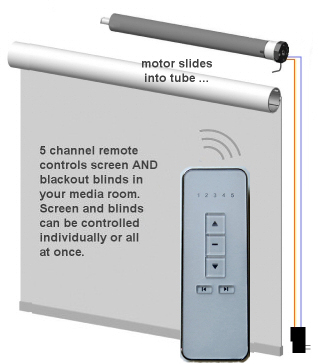 As per the blind and shade motor programming instructions, the setting switch is used to clear the channel assignment memory and to assign a new remote control channel. Note that the bracket for the motor end has a slight jog in the profile; we mention this just in case you are dealing with very tight tolerances in your application. These blind and shade motors can be purchased in the extra heavy duty Maxi section of our online store.